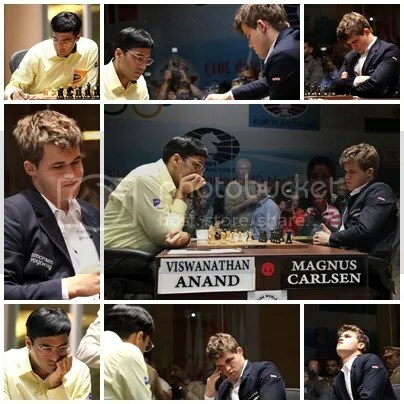 Elite-GM Magnus Carlsen claimed the crown from the defending World Champion GM Viswanathan Anand of India, who reigned as the undisputed World Chess Champion for 6years 1month & 24days since 29 September 2007, by registering 6.5/10 points from his 3Wins-7Draws-NoLoss record. Anand scored 3.5/10 (7Draws & 3Losses). R1 to R4 were testing the waters for both sides, groping, making assessment on opponent’s strength & weaknesses as well as getting that much needed confidence for the scheduled 12-rounds (maximum) of ‘Standard’ chess. All four games ended in draws and the score was even @ 2.0-2.0 after R4. In R7 & R8, Carlsen was defending the big 2-pts lead & settling with draws scoring 5.0-3.0 after R8. Both games ended under the first time control (after 32 and 33 moves of play respectively). In R9, Anand tried vainly opening with 1. d4 for the 1st time (he opened 1. e4 in the previous rounds with white) but his attempt fizzled out & resigned after 28 moves. Score 6.0-3.0 for Carlsen. R10: A must for Anand to score perfectly the last 3-rounds to get even, a very tall order, attempted a sharper Sicilian line with black, however, Carlsen needing only a draw, stirred the game evenly ‘til the draw was agreed on move 65, scored 6.5-3.5 and the World Crown. Carlsen had gained a +2.0 in rating points (R1 to R10) bringing his Live Rating to 2872 and matching his ‘All-Time-High’ FIDE rating of 2872 (Feb 2012 – April 2012 FIDE rating list) come December 2013 FIDE rating list. His Tournament Performance Rating (TPR) or Rating performance (Rp) was 2885. 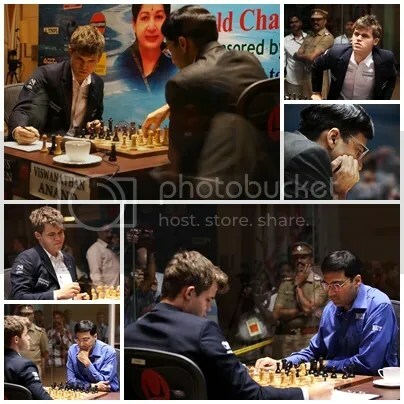 With this feat, as the 16th ‘undisputed’ World Chess Champion, GM Magnus Carlsen (born 30 Nov 1990), @ age 22yrs-11mos-23days (as of 22 Nov 2013) also became the 2nd ‘Youngest’ World Chess Champion (Official & Undisputed). The youngest to capture the official & undisputed World Chess Champion title was Garry Kasparov, who in 9 November 1985 @ the age of 22yrs-6mos-27days became the 13th World Champion. Carlsen was just 4 months & 27 days older than Kasparov and 6 months & 5 days younger than Mikhail Tal (8th World Champion) who came in as the 3rd Youngest World Champion at the age of 23mos-5mos-28days (as of 7 May 1960). 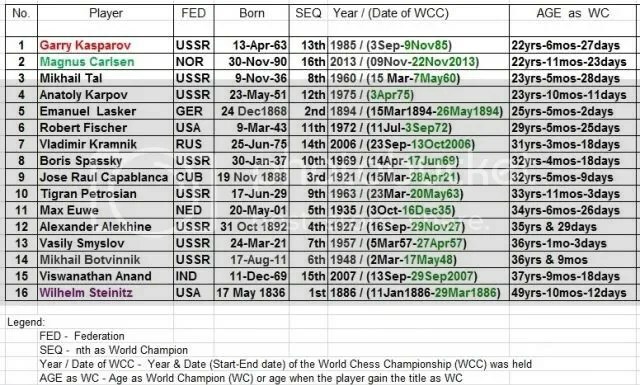 Listed below are the rest of the official/undisputed World Chess Champions in ‘Standard’ chess arranged in the order of the youngest to the oldest when they achieved the title. 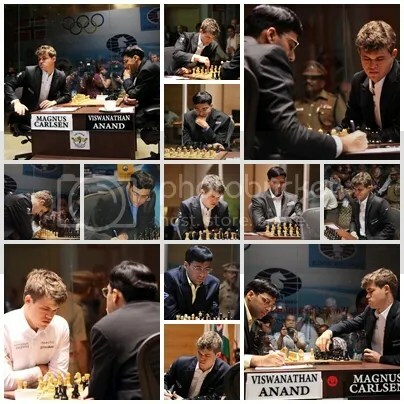 Practically, Magnus Carlsen, had already achieved and completed the entire dreams and aspirations of every chess player. These could be summed-up in 5-milestones i.e. GM title, breaching the 2600, 2700 & 2800 marks and becoming a World Champion. But of course, the zenith and ultimate of that dreams and aspirations … is to become the undisputed World Chess Champion and Carlsen had made it @ age 22. 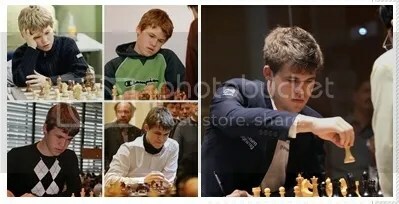 On 26 April 2004, Magnus Carlsen became a Grandmaster at the age of 13yrs-4mos-27days making him the 3rd youngest in history. On January 2006 FIDE rating list Carlsen breached the 2600 mark with an official rating of 2625 at the age of 15yrs and 32 days making him the 4th youngest in history (updated as of 1 Nov 2013). On July 2007 FIDE rating list Carlsen breached the 2700 mark with an official rating of 2710 at the age of 16yrs-7mos-1day making him the youngest in history. On November 2009 FIDE rating list Carlsen breached the 2800 mark with an official rating of 2801 at the age of 18yrs-11mos-2days making him the youngest in history. 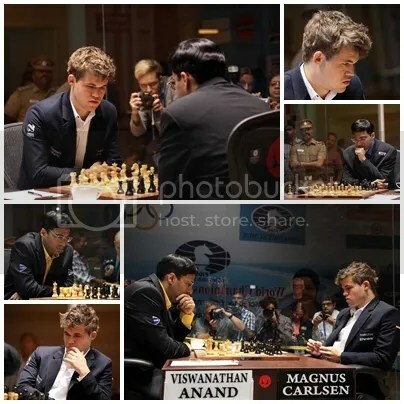 On 22 Nov 2013 Carlsen scored 6.5-3.5 points after 10-rdns (12-rdns maximum) of play versus the defending champion V. Anand to clinched the undisputed World Chess Champion title at age 22yrs-11mos-23days making him the 2nd youngest undisputed World Champion in history. 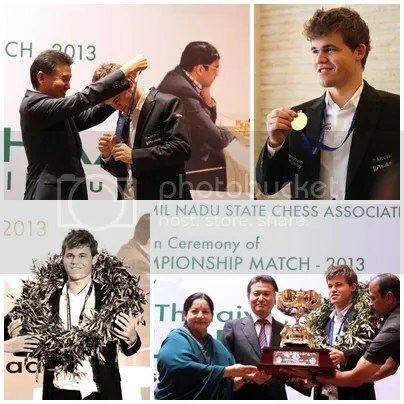 Looking forward for Magnus Carlsen … to be the 1st player ever to breach the 2900 mark … the 6th milestone !!! Carlsen’s victory affirms his status as the strongest chessplayer in the world today. In his generation, he stood out among very strong chess players like Kramnik, Aronian, Grishuk, Ponomariov, Topalov, Nakamura, and Anand. He reminds me of Bobby Fischer. The difference between them is, in Fischer’s time, he had to climb the seemingly impregnable wall that separated Russia from other countries of the world. Fischer singlehandedly crushed the Russian Chess Empire. 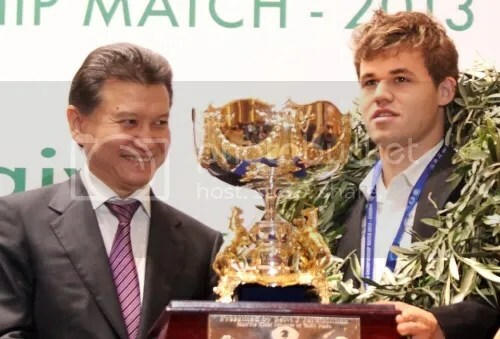 In Carlsen’s time, chess talents and opportunities have already spread throughout the whole world (thanks to Campomanes), so much so that the Russian’s chess dominance had been shattered. Let’s face it, Carlsen playing in a match competition against a Russian today is not like Fischer playing against a Russian in the old days. In the old days, a player was playing against the whole Russia, not just one player. Anyway, so much of the old stuff. 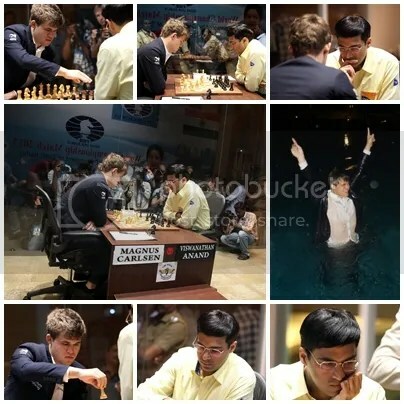 Let us not take the credit from Carlsen, a chess genius that comes once in a lifetime. His victory in Game 6, was, for me, the turning point. 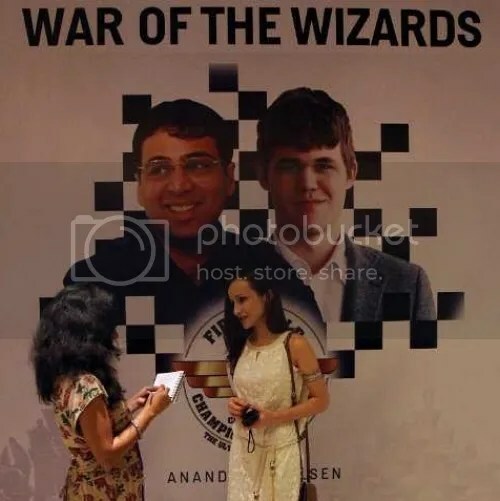 He was able to squeeze a win out of an unclear or seemingly drawish position, and the victory smashed whatever left of Anand’s confidence.